These trails comprise one long and one short trail amongst the natural fynbos, overlooking the Garden and the ocean. It is difficult to imagine that this area was completely burned in 2010 as the recovery of the plants has been excellent. The Fynbos Trail and the Zigzag Trail from the Round Bridge. 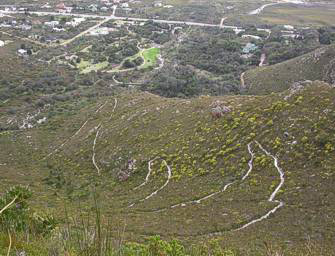 These two trails traverse the southern slopes of Bobbejaanskop and The Plateau, providing magnificent views over Betty’s Bay to the sea. The estate belonging to the Garden encompasses a whole river system, from its source down to the sea and this can be viewed by walking the Zigzag Trail. These trails are situated on the edge of the designated ‘core zone’ of the Kogelberg Biosphere Reserve which was promulgated in December 1998, the first Biosphere to be declared in South Africa. The cultivated section of the Garden with all its infrastructure and the towns of Betty’s Bay, Kleinmond, Pringle Bay and Rooiels all form part of the ‘buffer zone’ of this superb Biosphere Reserve in the heart of the Cape Floral Kingdom.